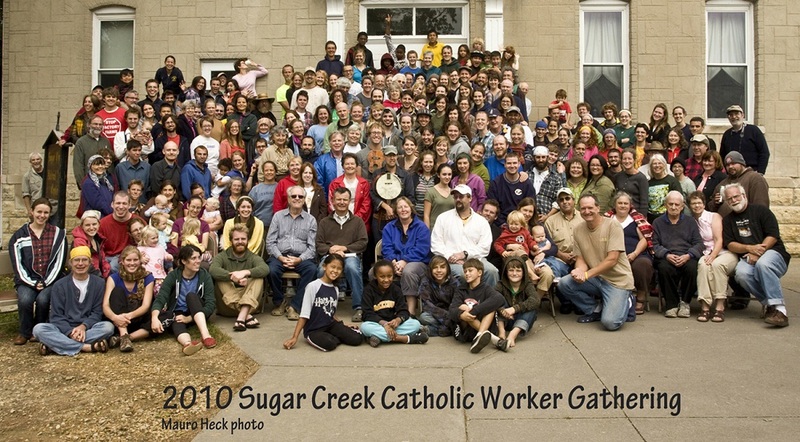 At Catholic Worker gatherings over the years, our lack of racial diversity of has been a frequent topic of conversation: “Where are all the people of color?” The movement, at least in its current incarnation, seems to attract largely middle-class folks, and mostly white people (of course, with many exceptions.) There has been some good thinking and work around the issue of our homogeneity for decades, but without much real large-scale change. 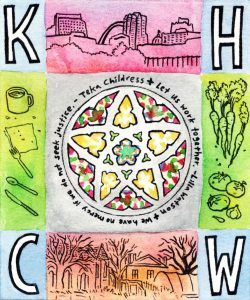 In the past few years, Karen House Catholic Worker in St. Louis has been doing some exciting (and scary!) 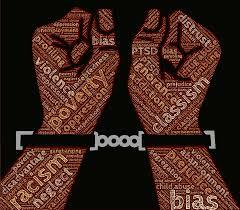 work examining ourselves and changing structures to become a more anti-racist, anti-classist community. After the murder of Mike Brown and uprising in Ferguson, our communal energy expanded to join and support the Black Lives Matter movement while we continued to do hospitality (And since then, we’ve been so heartened in witnessing other CW communities across the country supporting their local movements!) A shift occurred for us during this time. We talked, prayed, and had meetings with a new urgency about how to directly confront the racism present in our own community. We started changing some nuts and bolts of how we run the house. We wrote down the specific responsibilities of different levels of participation in the house, to make the process of moving into the house or joining the Core Community more transparent. (This is a particular way that racism shows up in organizations and communities — basing membership on who you know, and subject to the implicit bias of current members.) We are now welcoming volunteer groups differently, trying to balance the (sometimes opposite) needs of volunteer groups seeking “face to face” interactions with the needs our guests who consider Karen House their home. It is an experiment in constant flux. As part of this transition, we decided to revisit our founding principles by looking at both the CW Aims and Means, and our Karen House-specific document based on it through a specifically anti-classist, anti-racist lens. 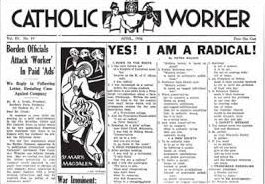 The Aims and Means are the guiding principles of the CW as penned by Dorothy Day, influenced by Peter Maurin, and updated annually by the New York Catholic Worker. 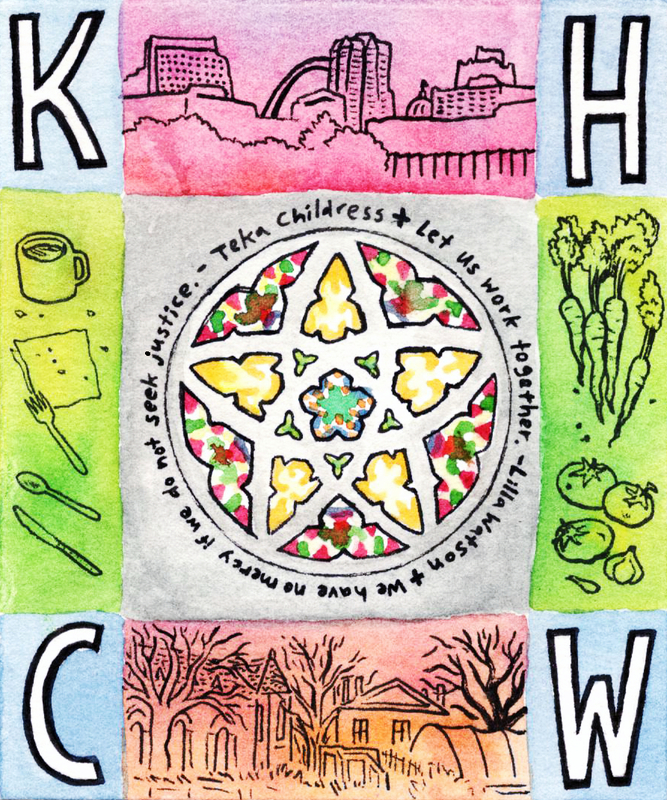 In 2011, Karen House created a vision statement that described how we interpreted and enacted these principles in St. Louis. The process of revisiting these founding principles deepened our understanding of the ways we have largely become a movement for white, middle-class, able-bodied people (of course, with exceptions.) These principles have brought life, identity, and purpose to so many of us who were previously floundering in the malaise of capitalism and consumerism, and yet something about them, and our practice of them, makes the movement appealing to very narrow (and socially privileged) group of folks, despite our own sense of being a radical movement. On first read, it was obvious that both documents required an advanced reading level to even understand the vocabulary and concepts. We learned that the CW Aims and Means scored a 42 out of 100 in the Flesch–Kincaid readability test (A score of 100 is considered “very easy to read”). In comparison, Harvard Law Review scores in the low 30s, Time magazine averages 52, and Reader’s Digest scores at 65 . A values statement that can only be understood by people with a college education is intrinsically exclusive to those without class privilege. Both documents, by using the first person voice, assume certain things about who is already in the movement and who is explicitly welcome. We noticed this particularly in the areas of Green Revolution and manual labor. In both these tenets there is a theme of rediscovering roots, of getting back to the land, back to simplicity, and back to manual labor. Our community does value these things, but we also wondered where this leaves people who have already lived a life of manual labor, enforced frugality, or subsistence living? These realities are not acknowledged. The implicit message is that “We welcome only those who want to voluntarily rediscover these things.” The tenet on manual labor says nothing about the history of slavery in the U.S. This omission both ignores folks whose ancestors were enslaved, and also creates a strange dynamic of promoting the beauty of working with your hands while ignoring the reality of those who haven’t had, or don’t currently have the choice. Likewise, the Green Revolution tenet discusses “rediscovering our true bond with the land”. It is clear whose point of view is being represented – those who have lost their connection with the land. How does this read to an Indigenous person, whose land was stolen by European settlers, who perhaps does not need to “rediscover” that bond? In writing our new statement, when we talked about labor, voluntary poverty, and the environment, we tried our best to either name these realities or simply name the intent without presuming a certain point of view that might exclude a group of people. Does the ideal and current practice of voluntary poverty in the CW presume that members begin with some level of material wealth? In what ways does voluntary “downward mobility” appeal only to those who have experienced a life of financial stability? How do poor and working class people interpret this value? It’s been our experience that our friends who are economically poor and working class and also many people of color, seem puzzled and a little off-put at the concept. We also noticed that the language in both documents created an ‘us’ (people doing the work, not poor or voluntarily poor) and a ‘them’ (people who need help, the involuntarily poor). The subject of nonviolence has also been a hot topic lately. 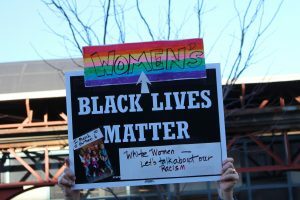 In the midst of the Black Lives Matter movement, our community has heard the feedback that people of color are fatigued and angered at being told by white people how to respond to racist oppression. We’ve also noticed the ways that the term “nonviolence” has been used to silence the voices of people of color to actually promote the status quo. We have also realized that what white folks categorize as “violent” can sometimes be a reflection of a culturally-white practice of politeness and compliance with police and state power. The tenet of nonviolence in the CW Aims and Means lists several “excellent means” of action in resisting injustice, but doesn’t acknowledge that targeted groups have the right to decide for themselves how to respond to oppression aimed at them. Nor does it acknowledge that many of the suggested actions require class and/or race privilege (for example, long-term war tax resistance often requires legal help and arrestable direct actions put people of color more at risk than white folks). These observations may unimportant or nit-picky, but the underlying manifestations of exclusion are ubiquitous in service and justice groups. Too often, white-led groups such as the Catholic Worker bemoan the “lack of color” in our groups and ignore the seeds of oppression that make our organizations inaccessible. Oppressions like racism, sexism, and heterosexism are just as present in community life as the are on a larger structural level. As our community moves forward, we hope look at our structures with through more social identities such as ability, age and gender, hopefully expanding our walls to welcome a greater diversity of people. Are our changes perfect? Of course not. Are they a good start? I hope so. Many times during this process we have had to fight off the “Who do we think we are?” demons to humble examine these documents through new lenses. Mostly, we want to create, as did Dorothy and Peter and many before and since, a home where people feel loved and comforted, able to dream and love. We love the Catholic Worker and cherish the writings of Dorothy Day and Peter Maurin. We want to continue the work they started, and to be led by the Spirit, with the ability to evolve- updating our principles with new understandings and knowledge. We want to honor those we stood by, and continue to stand by, in Ferguson. We want to be part of a more radically inclusive Catholic Worker movement. We want to acknowledge all of our teachers, from Dostoevsky to our neighbors quietly offering hospitality without fanfare or a donor list. Dorothy said of people, “Some moved out and that made room for more.” Can we say the same thing for ideas that need to evolve? Let us move out any unwelcoming idea or practice in our movement to make room for even more love.